The US dollar is being inflated at an unprecedented rate. Dollars are being created on an improper basis, mainly by monetization of the government’s budget deficits, in order to bail out financial institutions and companies deemed “too big to fail.” While small businesses and workers are being made to suffer, dollars are being lavished on the military-industrial-financial sector. With dollar inflation, the general level of prices will eventually increase, the dollar will lose much of its purchasing power and dollar denominated investments will become worth less in terms of goods and services. The big question is, how can savers protect themselves from the adverse effects of inflation? How can middle-class people protect their small nest-egg savings and avoid seeing it shrink in purchasing power? One can either invest in something that will command a higher price as the value of the dollar shrinks, or one can acquire investments that are denominated in some more stable unit. There are many historical examples of hyper-inflation of national currencies and citizens’ responses to them. One example I’ve written about in my book, The End of Money, is the German hyper-inflation of 1921-23. Another is the current inflation of the currency in Zimbabwe. In that book and in my previous books, I’ve proposed the adoption of an objective measure of value based on an assortment of basic commodities. Another option is to define a more stable measure of value and pricing unit based on existing government statistics. One such example of the latter is the Chilean Unidad de Fomento (UF), which is a pricing unit based on the Chilean Consumer Price Index. Here is the description of UF from Wikipedia. The Unidad de Fomento (UF) is a Unit of account that is used in Chile. The exchange rate between the UF and the Chilean peso is constantly adjusted to inflation so that the value of the Unidad de Fomento remains constant. It was created on January 20, 1967, for the use in determining principal and interest in international secured loans for development, subject to revaluation according to the variations of inflation. Afterwards it was extended to all types of bank loans, private or special financing, purchases or investments on installments, contracts, and some special situations. Also it is used in legal standards such as the par value of stock/capitalization of companies, fines, etc. It has become the preferred and predominant measure for determining the cost of construction, values of housing and any secured loan, either private or of the Chilean government. Individual payments are made in Chilean pesos (the country’s legal tender), according to the daily value of the UF. The main drawback of using government statistics as the basis for a value unit is the fact that they are subject to political influence and manipulation. The U.S. CPI, for example, greatly understates the true cost of living. This is strongly argued by Chris Martenson in his Crash Course. Better than nothing, perhaps, but not really good enough to forestall a wipe-out of the middle class. We need an independently defined measure of value. I’ve described how to construct such a measure; what remains is to choose the specific commodities and the markets in which they are traded, to give that unit a name and to publish it. This entry was posted in Developing Alternatives, Prescriptions, The Political Money System and tagged Chile, inflation, measure of value, unidad de fomento, unit of account. Bookmark the permalink. of gold, silver, platinum, palladium, and rhodium. Or, if a more expanded group is desired, perhaps a mix of industrial metals such as copper, etc. I have long argued that such a unit should best be defined in terms of real physical commodities that are actively and freely traded. All of that is articulated in Part III of my very first book, (Money and Debt: A Solution to the Global Crisis (1990)) which can be freely downloaded at https://reinventingmoney.com/money-and-debt-a-solution-to-the-global-crisis/. In my later books, I outlined how an objective composite standard measure of value can be defined (See The End of Money and the Future of Civilization, Appendix B). Here are some of Christopher M. Quigleys statements I am passing along as he is also good at quoting Riegel. But a change is occurring. People are becoming educated and aware about issues they were formerly ignorant of. The catalyst is the internet. This technological marvel is to contemporary consciousness what the block printing press was to the enlightenment. Now anybody who wishes to learn about anything can do so, all that is required is the desire and the motivation. As we speak the greatest revolution in education is occurring. Old institutions of learning are being rendered obsolete. Television, magazines, books, newspapers and broadcast radio are dying, soon to be dead, as mediums of profit. Through the mass detailed information now freely available deep research is possible to all. As a result more and more groups are connecting the dots and the result is an epiphany and a revelation concerning the financial manipulation and fraud that surrounds them. The generation of the 80’s achieved “awareness” through drugs and music. The present generation is growing in consciousness due to information and knowledge. The Emperor is been seen to have no clothes. History shows that the best form of attack emanates from a strong defense. More and more folk are defending themselves from the excesses of the financial game by refusing to play. By limiting their need for consumption they are increasing their freedom and their ability to act. A movement is awakening from the slumbers of complacent ignorance. Through community self-inter-reliance, groups are discovering the power of co-operation rather than competition. In this zeitgeist peace and morals do matter. Family, community and country do matter. The environment and nature do matter. Within this orientation the current financial game is seen as a rigged corrupt veneer fronting a privileged group whose mindset is based on a command economic philosophy. Its language is in the modalities of freedom but its actions indicate an immoral and ruthless selfishness. As long as these forces control the monetary unit of America the exploitation of the many by the few will continue. Without monetary freedom all other freedoms are a mime. 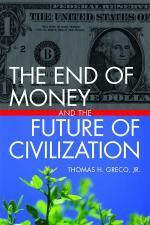 A moral monetary unit will only come about when money can only be issued upon the creation of real value. Fiat inflation must stop. It is time Americans had a moral currency again. This goal demands the end of the Federal Reserve political money system and the beginning of a new world currency unit, issued by free net-working communities. Many say this new money unit should be called the RIEGEL after E.C. Riegel who died in poverty, in a cold water flat, in New York City. He believed in “civitas” (the common good) and accordingly devoted his entire life educating America towards this most noble human goal. “It has been said that a communist is a socialist in a hurry and that a fascist is a socialist dragging his feet. They all face in the same direction. All groups whether they are called radical or conservatives, progressive or reactionaries have TURNED THEIR BACKS ON PERSONAL ENTERPRISE, and their faces directly or obliquely toward State dictatorship. (Collectivism) as G. Edward Griffin would say. M.A. All advocate state intervention in some form or other………………. ……..wishes to save it to cover future needs………..
do you mean in a savings account??? in a jar??? does saving ina a savings account have a different affe3ct on saved dollars than placing them in a jar? is the jar dollar saver a significant part of teh economy??? No difference. Paper dollars in a jar or dollars in a savings account will both lose purchasing power. i dont know if this is true or not. does the monetization …dollar inflation….help more than letting the large companies go under? what do you mean by saver? an income earner who puts dollars into a savings account or any human who stores nuts and loose change in a closet?? The whole idea of private enterprise is reward for taking risk. When private capital is rescued with public money, it is unfair to the public and it encourages fat cats to take more risk knowing that they downside will be borne by the public. A saver is someone who has temporary surplus and wishes to save it to cover future needs. Inflation eats away at the purchasing power of dollar denominated claims like saving accounts, CDs, bonds, most pensions, etc. At the inception of a new monetary unit, it would be theoretically correct to launch it at par with some item or items of commodity value. Since we already have operating monetary units in existence, however, it would only be necessary in practice to base a new unit upon some such existing unit or fraction or multiple. For if we made up a market basket of some or all commodities that are now passing in exchange and tabulated, say, their dollar prices, we would find that one dollar represented some fraction of the whole. In other words, all existing monetary units are already based upon a market basket, and a new monetary unit would be based upon a market basket by accepting an existing unit as the criterion for the new. That is how the American dollar was established, by introducing it at par with the Spanish dollar then current in the States. Thereafter, it followed its own course. The Spanish dollar has long since passed out, but it provided the springboard for what has proven to be the most stable unit in the world. Money is an obligation expressed in terms of a value unit and issued by a buyer in exchange for value from a seller. It is transferable and acceptable to other sellers for equivalent value, and is ultimately redeemed for equivalent value by the issuer.